Hardwicke Drummond Rawnsley was a country vicar of the C of E who was also a poet and hymn writer. He published in excess of forty books, some of which were poetry while others included a biography of his good friend John Ruskin and a number of studies of the natural beauty of his beloved Lake District. He was a prolific sonnet writer and it is believed that he produced around 30,000 of these. Additionally he was active in local politics and a driving force behind the founding of the English National Trust, a body which is dedicated to conserving places of Historic Interest or Natural Beauty. He spent over thirty years of his life in the Lakeland area and laboured tirelessly on behalf of the exquisite countryside around him. He was born on the 29th September 1851 at a rectory in the small village of Shiplake in Oxfordshire. His father was the local vicar and Hardwicke was the fourth child. He had a good education, firstly at Uppingham and then on to Balliol. He excelled at physical sports such as rowing and athletics and graduated in 1874 with a 3rd class degree, supplementing this with a MA the following year. He was also made a deacon that year and was appointed to the position of chaplain at Clifton College’s mission. Rawnsley was part of many movements to protect the landscape from over development and was aided in this cause by such luminaries as Alfred, Lord Tennyson, John Ruskin, and the Duke of Westminster. 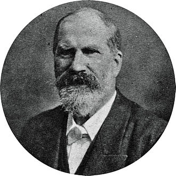 When he moved to the Keswick area, he took a keen interest in educational matters and, helped by his wife, set up classes in practical subjects like metalwork and eventually his efforts led to the formation of the Industrial Art School, based in Keswick. This establishment remained active for a hundred years. He was tireless though in his campaigns against plans to build roads and railways around and across the fells that he so loved and he achieved great success in this. When the National Trust came into being it would ensure that his desire for a relatively undeveloped region would prevail. He had served as chaplain to the Border Regiment’s Territorial Force during the war but, due to his age, did not see any active service. Hardwicke Drummond Rawnsley died on the 28th May 1920 at the age of 68, at his home in Grasmere, a property named Allan Bank where William Wordsworth had lived over a hundred years before. His final gesture towards the National Trust was to bequeath the house to the nation although it was lived in by his second wife, Eleanor, until the day she died in 1959.